Sometimes the Christmas season comes and goes in such a blur that aside from watching a few Christmas specials on TV, I feel like I missed the whole spirit of the season. This year, I am making a deliberate point of trying to engage the whole family in meaningful holiday activities, with one caveat -- they have to be free. And I want to share the free fun with you, so read all the way to the bottom for your chance at a $75 giveaway! When Bargain Briana offered to hook me up with the good people at RIDEMAKERZ for a free bloggers' event last weekend, I jumped at the opportunity. Briana put me in touch with Natalie who was coordinating the event aimed at bloggers with boys aged 5-13. But Natalie wasn't about to let Annie feel left out and she must have heard about Mike's childlike tendencies as well because she invited the entire family to RIDEMAKERZ on Sunday for a free afternoon of high octane fun. If you're not familiar with RIDEMAKERZ, think Build-A-Bear Workshop, only instead of stuffed animals with fashionable attire, you get cool cars with totally rad accessories. Mike and Charlie had actually been to RIDEMAKERZ once before, so they were really revved at the prospect of getting to go again. 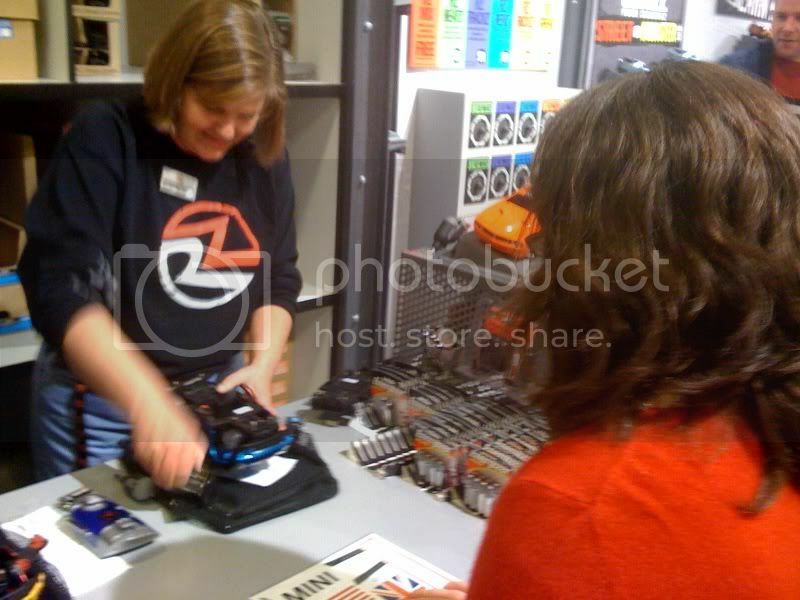 When we arrived, Natalie greeted us and handed me $375 in RIDEMAKERZ gift cards! Now that's what I call free fun! A few minutes later Marilyn -- apparently the head "mechanic" -- gathered all the bloggers and their families, including Angie from Angelica Grace Designs and Eric from IndyDads.com, and gave us the low down on the RIDEMAKERZ process. First, we all picked the shell of the car we wanted to build. The shells start at $12 and go up to $29. Robbie wasted no time picking "the fire car." Annie had planned to pick the pink Corvette, but changed her mind when she saw the blue Mini Cooper, which apparently is her "dream car." So I took the pink car, while Charlie chose a blue truck and Mike picked an orange Dukes of Hazzard looking car. (Note: the cars all have official names, but asking me to tell you what they are is pointless, though I do know that the Corvette is the newest addition to the RIDEMAKERZ line-up. From there, we moved on to the sound station. Each car comes with a standard tires pealing sound, but for just $3, you can choose a custom sound, which we did. RIDEMAKERZ mechanics were waiting at the next station to install the chassis -- which I think is the underbody of the car. I'm sure Charlie could tell me for certain. Anyway, you can choose a street chassis or a jacked up monster chassis. We all went for the street version, except Charlie. This is the station where you can also add radio remote control capability to the car. It's a $25 charge, but absolutely worth it! Next we chose tires -- the standard black tires, which suited my pink car or tires embellished with color treads -- and hubcaps. Who knew hubcaps come in as many different varieties as nail polish does? Then it was on to the pit challenge where we realized Charlie had already lost his remote control. Seriously? We had only walked 5 feet! But the RIDEMAKERZ crew was totally cool and found it quickly. Apparently, they've worked with their fair share of 9-year-old boys. Remote safely back in the basket, we set about using the cool pit crew tool (I won't even guess what that's called) to screw in the bolts to lock in the body of the car to the chassis. I think that was Robbie's favorite part. Once the cars were assembled, it was time to accessorize. Finally, something I could relate to! The most awesome part about the accessorizing is that you could choose anything -- lights, sirens, turbo jets -- from the wall, try it on your car and return it back to the wall if you didn't like the way it looked. Charlie, Annie and I chose underbody lights for our cars. Robbie went with the turbo jets. 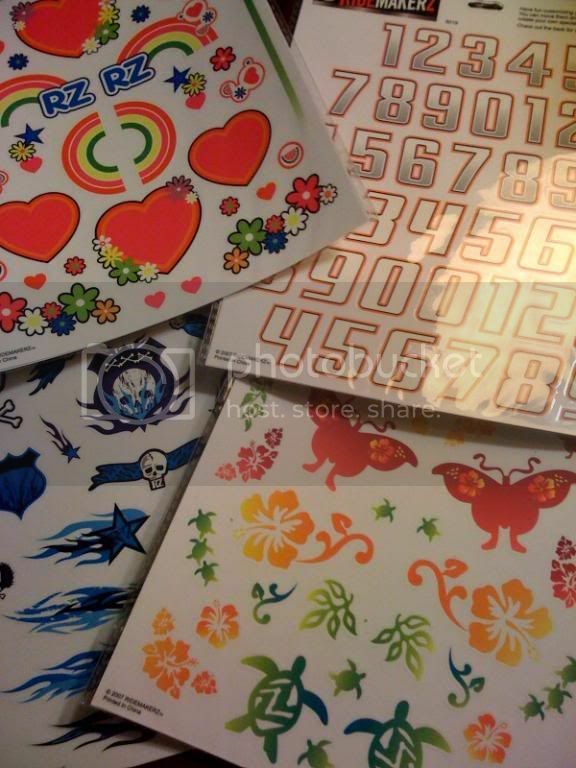 We also picked out stickers -- an inexpensive ($4), but cool way to customize your ride. Because we were giving away our cars, we didn't put the stickers on the cars at the shop. We wanted to let the eventual owner of the car have the fun decorating it. To finish off, we sat at the computers and registered our cars. When it was time to check out, we got a title and little license plates customized with a name of our choosing to add to the car. When we got home, Robbie played with his car all afternoon, including using it for auto bowling. Annie and Charlie got out the cars Charlie and Mike made last year. 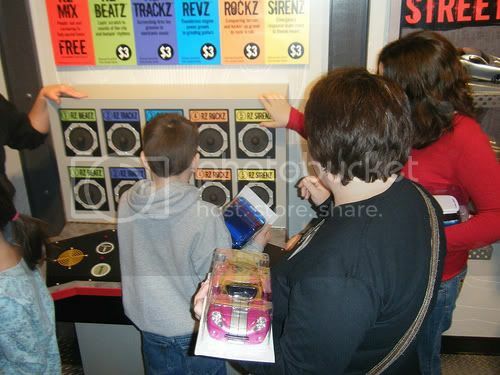 So in addition to a great activity for free, RIDEMAKERZ gave us an interruption-free afternoon because the kids were so busy playing with their rides. And tonight we headed over to the children's hospital and gave them General Lee, PrtyNPnk, HyperDrive and Dream Car, paying forward RIDEMAKERZ's generosity. Thanks RIDEMAKERZ for making this possible! We'll definitely be heading back to RIDEMAKERZ -- Charlie wants to celebrate his birthday there. 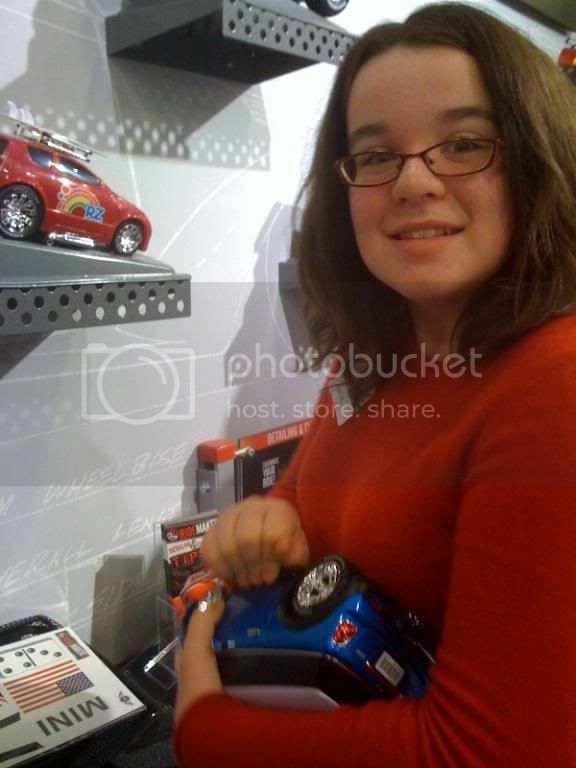 And Annie wants to go back and buy a blue shell to put on the black Mini Cooper Mike made last year. That's what's great about these cars -- you can go back later and change them. Don't want to shell out the $25 for remote control right now? You can still make an awesome ride and come back for the remote as a reward for say, good grades. Or you can change up the sound for almost pocket change. In fact, you can go to RIDEMAKERZ, choose a body for under $20, select all of the stock items (sounds, chassis, tires, hubcaps), and still have a toy that rocks! And you know what else rocks? (This is the part that you've been waiting for!). In addition to giving me gift cards to use for my family on Sunday, RIDEMAKERZ gave me a $75 gift card to giveaway on my blog! That's right -- you or someone you love can trick out your own ride courtesy of the 4th Frog and RIDEMAKERZ. And if you don't have a RIDEMAKERZ shop near you, no sweat. You can buy RIDEZ in a box right on the website and get the whole awesome experience in the comfort of your own home! Earn 1 entry by leaving a comment on this post or other posts I make this week. Be sure to leave your first name and last initial. Earn 3 entries by blogging about the giveway on your own blog, then linking back to this post. Earn 5 entries by subscribing to the 4th Frog Blog via e-mail (see the right-hand column). If you're already a subscriber, just leave me a comment letting me know you want the 5 bonus entries. Entries will be accepted until midnight Thursday night. I'll draw the name of the winner on Friday morning, so be sure to check back here then. And I'm impressed. Still a newer blogger, and you've already got a giveaway. Dang girl. Amy, the pictures look great. I love the post and how you walked them thru it all step by step. Awesome job! It was a spectacular event. Maybe we should work on organizing more Indy blogger events around town. Let me know if you are ever interested in tag teaming something together. This is such a great idea for boys. Having 3 boys myself I know they would go crazy at this store. I'm also going to sign up for your email - I so glad I found your blog. Good stuff! I'm going to comment... and I'm going to link on both of my blogs... you should post on IndyMoms, too, if you want oodles of traffic! I don't need to be in the running to win. If I do, I'll just pay it forward to someone like you did. Because I don't have a need for this in my family. But I had to tell you that I love that you guys donated your extra cars. That really touched me!! very inspiring blog! What a great idea. I'm hooked. This is so cool. 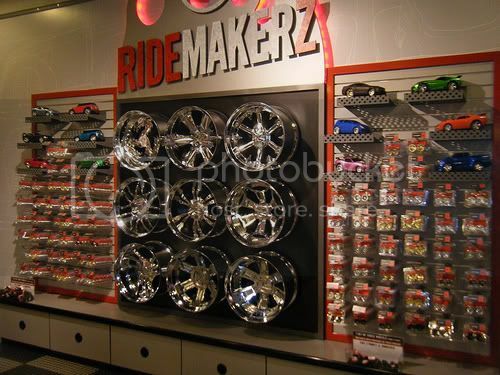 I have seen RideMakerz when I stroll through Castleton Square Mall in Indianapolis, but I have never set foot in there because it looks like a high end type store. It sounds like a ton of fun, and my dad is coming down here for Christmas break, so it might be fun to show him this store since he loves cars. (I wouldn't mind winning the gift card to surprise him that he could actually make one). Thanks to the IndyMom who posted about this!!! Very Cool! Your blog is much cooler than my blog. Its boring now that mom is getting better. But that is GREAT! I am thinking about revamping for the new year- of course I don't have quite as much material as you! The cars look very cool and I could see my Andrew (my nephew) really enjoy that! Looks like you all had fun! Amy, that is so cool! Ridmakerz is new to me. My kids would love it. Thanks for sharing. I don't know whether my nieces would enjoy this over painting pottery or build a bear, but hey, I'm game! Hi! I am having a great time reading your blog. It would be even better if I had a margarita every time I read it! I'm not too familiar with blogging, but I'm pretty addicted to yours. It's even better since I know your kids! I want to win!!! :) Thanks for the link love and I'm glad you could come! Leave me off the giveaway as my little guy is only two, but I just wanted to say that it is a great giveaway and a really cool place! I hope they have one around here by the time my little guy is old enough for it! I have heard a lot of good things about this place. I would like to make a viper. Thanks for the giveaway! My husband would love to do this. Thanks for the opportunity. I want to play - sign me up!!! I think I would have went for the cooper or the truck myself. Did you take pics of all the finished cars? Geez, I'll tell you.. 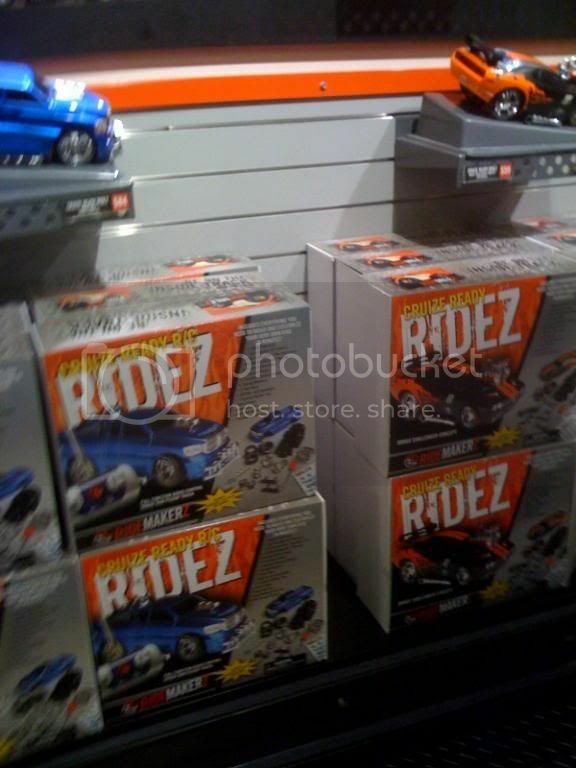 I think RIDEMAKERZ is THE gift of 2008. If auto bowling ever becomes an official sport, our sons will be a national celebrity!! My jaw dropped when I read this! This is so my thing. I've always wanted to Build-a-bear, but it did seem kinda girly, and I'm still a tomboy no matter my age. My hubby would really get into this too! I will subscribe via email for those extra entries too. Your blog is fun to read, giveaways or no! This is so cool. I would love to win! I also subscribed via the email link. Thanks! I blogged all about it Miss Amy! Thanks for the extra entries! I would love to win this for my son. Thanks for the chance! I subscribed to your blog too! Thanks! I blogged about it on my first blog ever! You can find it at http://buildatruck.blogspot.com/2008/12/build-car.html. I also subscribed via email. awesome giveaway! Lots of boys in my family I don't know who I'd choose! These are fantastic! My son would love the Ford Super Chief Concept! OMG!! I have never heard of this store!! I'd never be able to get my son out of it!! He's going to turn 7 on 12/21, so this would be the best gift ever!! He's ALL boy - muscle cars - VROOM!!! I just subscribed!! Love the blog!! Add 5 more for me!! THANKS!! This sounded like so much fun, I had to enter. Breakfast was fun on Tuesday, we will have to do it again sometime. Jason N.
I think this is such a great idea- my hubby and son would have so much fun building these together (and I love some of the cars, like the Scion xB!) Thanks! I just subscribed to your blog- looking forward to keeping up with the Fourth Frog-thanks! I think my step son would LOVE this! email subscribed. please give me 5 more entries! Four boys in the house for 2 1/2 weeks over Christmas break... I'm in the drawing for the giveaway. Plus what a great way to get subscribers. As you'll see I signed up... now put my name on a five pieces of paper or whatever you're going to do... and draw a House! Great giveaway! I'd love to win this for my boys! This would be a lot of fun! Thanks for blogging about your experience. Suite experience -- Go Colts! Does Santa have a Lands End gift for you? The 12 blogs of Christmas: #7 - O Perfect Nite! Wordless Wednesday: Hail to the Victor! Biggest Loser lovers -- are you ready?